Examine the tip and handle of this object closely. The tip is in the shape of what animal? What scene is depicted on the handle? What do you think is the purpose of this object? What is this object made of? What do these materials communicate about the user? Hover over the image to enlarge. Explore the details of the artwork to answer the questions above. Share your own ideas on Tumblr! The elephant that was steered using this tool made the Maharaja feel powerful. How do you think the elephant felt? New to Tumblr? Start here. The tip of this object, an ankus, is in the shape of an elephant’s head. The elephant driver or mahout controlled the animal using an ankus (literally “restrain”), which is a prod or goad. In India’s royal courts, elephants were highly valued for their power and their majesty. They had pride of place in royal stables and were used in important religious and secular processions. A hunting scene is depicted on the handle, with a rider on horseback and representations of a forest – ankuses were used especially during the hunt. Both maharajas and deities hold ankuses; the revered elephant-god Ganesha holds an ankus for example. This ankus is made of natural colourless sapphires and enamel set in gold. This example was made in Jaipur for ceremonial use. Jaipur is a city famed for its fine enamelling, which is created by grinding precious and semi-precious stones into a fine powder and was used to decorate the engraved surfaces of gold or silver objects. 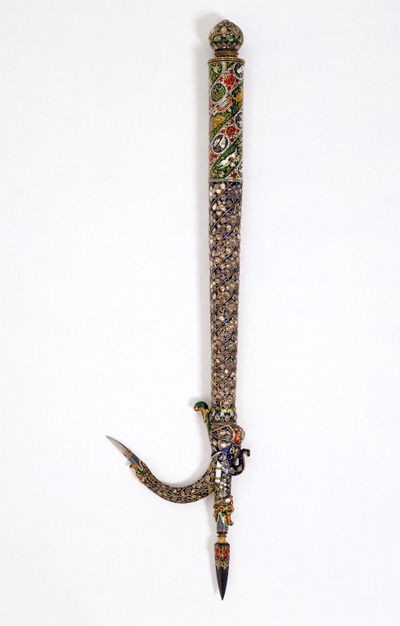 The use of such valuable and ornate materials suggests that this ankus was made for an extremely important and revered person, a maharaja. It's not an elephant, but this ornate silver carriage certainly conforms to many peoples' ideas of royal rides. Take a close look to see both the Indian and British contributions to its construction. In this portrait, the Nawab (another name for an Indian ruler) is looking directly at you - a significant change from how Maharajas were traditionally depicted in India. This type of representation reflects the changing tastes and power relationships taking place in India in the early 19th Century. This sumptuous throne is fit for a king, but was not the traditional furniture on which an Indian king would sit. The receiving and giving of gifts was an important ritual in the courts of the Maharajas. This painting was one such gift; what do you think it may have meant to the Maharaja who received it?